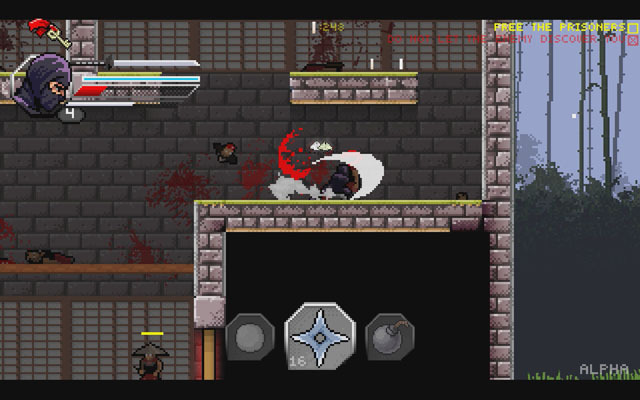 As it says on the tin, Pixel Shinobi: Nine Demons of Mamoru, from Ametist Studio, is a game about a pixellated ninja. However, unlike most other 2D video game ninjas - like Shinobi, for instance - this game has a focus on stealth, allowing the ninja to hide in tall grass and get the drop on his enemies, hide in the shadows, and creep up from behind to slit the throats of guards... or just go old school slashy-slashy on everyone's face with his katana and shuriken. The ninja can climb walls, make use of a variety of ninja weapons, and craft helpful items like explosives or a vial of poison, and he can train to learn new arts along a sizable skill tree. Pixel Shinobi: Nine Demons of Mamoru is now available for PC via Steam Early Access.